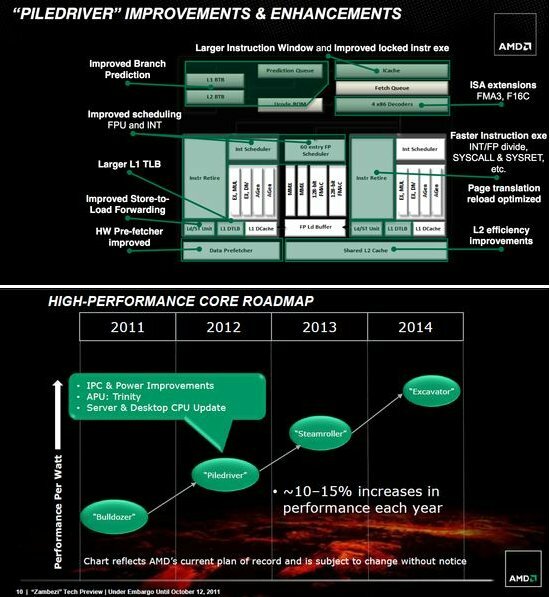 Hexus reports AMD's FX-8350 "Piledriver" based processor is anticipated to hit the market around August of this year. he firm has already shown us just what Piledriver is capable of through the release of its new Trinity APU line-up, which has generally been capable of offering improved performance at a lower power consumption, despite remaining on a 32nm production node. The Zambezi range will remain socket AM3+ compatible, with the head of the pack expected to be the FX-8350, which will feature eight cores with a 4 x 2MB L2 and 8MB L3 cache configuration. As it's likely to feature a 125 watt TDP, we expect the FX-8350 to be clocked 10 per cent faster than its FX-8150 predecessor and, with tweaks to the Piledriver design offering around a six per cent performance boost over Bulldozer at the same clock, according to early benchmarks of Trinity, the FX-8350 may just have enough *umph* to successfully break AMD out of its performance slump.